We are nearing the completion of mini pig Oscar’s second treatment of sarcoptic mange, and I have learned so much about mini pig mange throughout the past few months. Now that I am more informed, I have some regrets about how we handled Oscar’s mange the first time and a list of things I would have done differently. 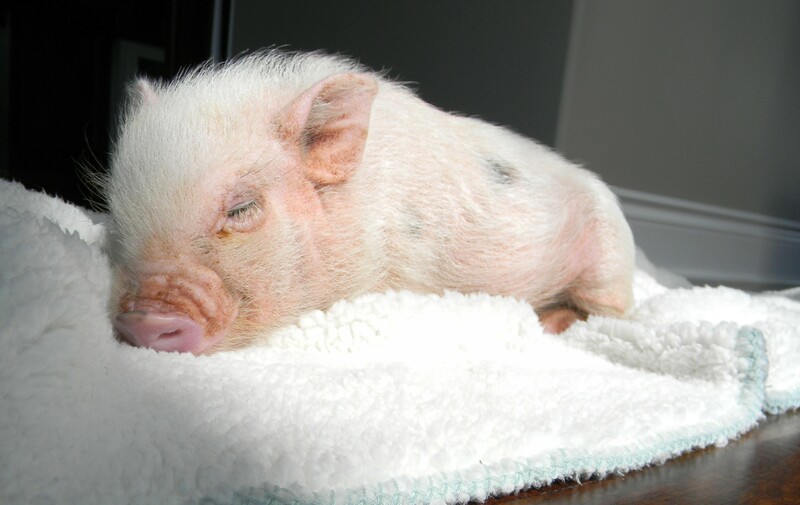 This is my third post in a series about mini pig mange, so check out my previous posts for more information on Oscar’s sarcoptic mange symptoms and mange treatments. Here are some things I’ve learned about mini pig mange from our experience dealing with it. 1) Mini pig mange can feel embarrassing, but it shouldn’t be. I was so embarrassed about Oscar’s sarcoptic mange in the beginning. I worried that people would think we didn’t take good care of Oscar or that we didn’t keep our home clean. However, in most cases, mini pig mange isn’t your fault and doesn’t mean anything about you, your mini pig, or your home. 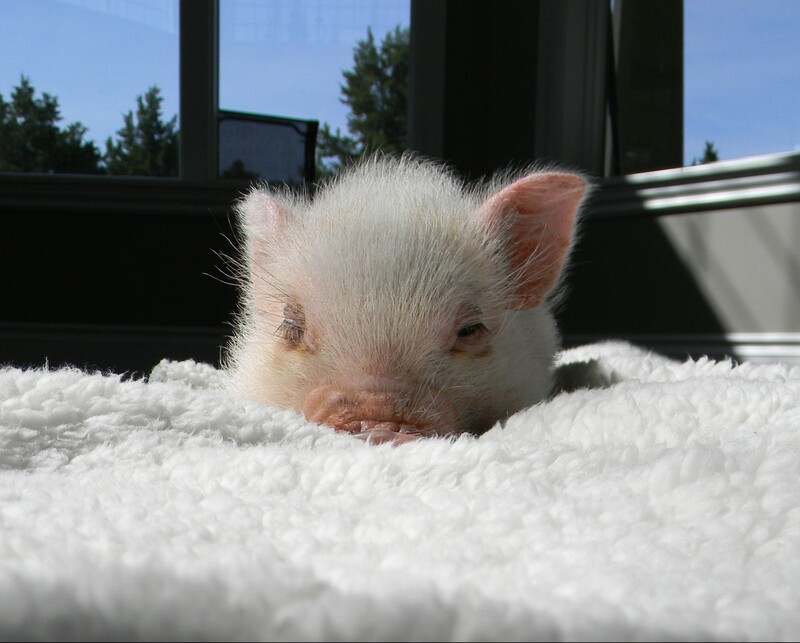 Mini pigs often come home with mange, and you did nothing wrong. Since I’ve been open about Oscar’s mange, I have received so much understanding and support, and I no longer feel embarrassed about it. Dealing with mini pig mange isn’t fun, but it’s a little easier now that I can talk about it and get support from others who have been there. 2) I wish I would have paid more attention to Oscar’s mange symptoms. The first time Oscar had mange, we recognized the obsessive scratching quickly and took him to the vet. The second time, Oscar’s scratching seemed normal but I overlooked the scabbing on his skin. I didn’t know if the brownish coloring on his usually pink skin was a problem or just part of a pig’s tough skin. In retrospect, I wish I had paid more attention to the changes in his skin and had known more in general about mini pig mange symptoms. Had I caught the symptoms earlier, we might have avoided the secondary staph infection from the mites and caused less irritation for Oscar. From now on, I will pay close attention to all of Oscar’s baselines, including his scratching frequency, skin coloring, and behavior so that I can monitor any changes or issues. 3) I wish I would have taken Oscar to the vet sooner. As I mentioned in the above point, I missed the symptoms the second time Oscar had mange. However, I will admit I questioned for a few weeks if the initial scabbing on Oscar’s skin was healthy, and I wish I would have taken him to the vet sooner than later. As a first time mini pig mom, I’ve learned a lot but still don’t always know what’s normal or what should be alarming, and in the future I will err on the side of caution and take him the vet if I see anything that appears abnormal. In the end, we could have caught the mange sooner and likely cost us less money by getting an early start on treatment. 4) I wish I would have been more thorough with Oscar’s first mange treatment. The first time we treated Oscar for mange, the vet recommended oral Ivomec and that we wash Oscar’s bedding after each dose. I was relieved that the mange was so easy to treat and followed those instructions. Unfortunately, Oscar was reinfected and now our treatment instructions are much more thorough to treat Oscar, our dogs, and to get rid of the mange mites in the house. I suspect we’re being overly cautious in the treatment this time, but I regret not having been more thorough initially. We might have avoided an extra month of dealing with the mange and also the secondary staph infection for poor little Oscar if we had knocked the mange out the first time. 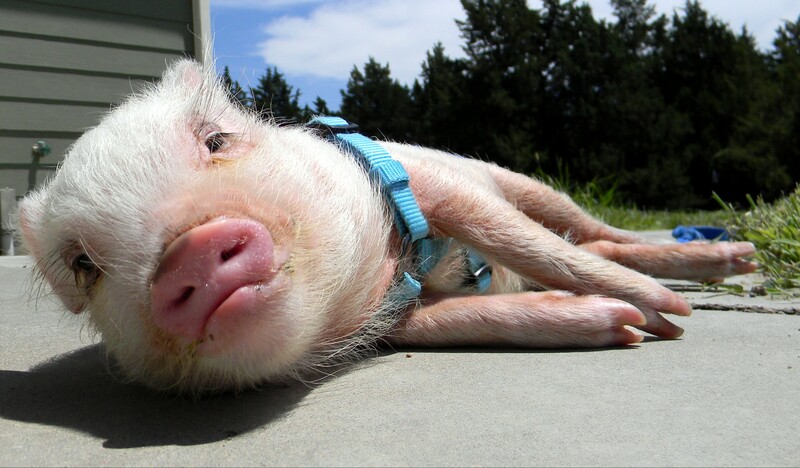 5) Mini pigs have more spirit and love in them than I imagined. I worried so much about Oscar’s isolation and how it would affect his socialization. Would he be mad at us? Would he become more wild? We carry Oscar outside for potty breaks and let him play in the yard, but he definitely isn’t getting the cuddles and attention he received before the isolation. Since he is still young and his recommended isolation was for so long, I thought we would have to start over on all of his training and socialization following the mange treatment. I was wrong. Oscar’s potty training has actually improved since he has learned how to squeal to “tell” me that he needs to go, and he is just as loving and sweet as ever. I have been impressed with Oscar’s spirit and flexibility throughout the changes during the treatment isolation period. 6) I’m not mad at Oscar’s breeder. When Oscar was first diagnosed with mange, I was frustrated at the breeder. I have reasons to believe the breeder knew mange was an issue for their piglets, so why didn’t they tell new owners so we could get treatment right away? Part of the reason, of course, is that it would hurt their business. However, now that I have learned more about mange, my belief is that many breeders struggle with mange but no one wants to talk about it. It would be great if piglets never went home with mange but, since that’s unlikely, it’s important that we start talking about it so that people have support and the knowledge to identify and treat it quickly. To be honest, I would buy from the same breeder again. The mange is frustrating but very treatable, and I wouldn’t trade Oscar for the world. He potty trained easily, is sweet and loving, and we adore his personality. Since mange is a risk with any breeder, I would pick the longer-term qualities of our mini pig over the mange any day. It’s easy to look back and see what we could have done differently, but at the time we thought we were doing the right things for Oscar. Hopefully we never deal with sarcoptic mange again but, if we do, I feel more confident in handling it. Even through the mange, my love for this little guy has grown so much and I am looking forward to having a happy, healthy mini pig running around the house again. I’m a new mini pig parent and am also dealing with the mange. Nice to read about your experience, im not as freaked out… haaha..
Hey Jon how is your mange situation going? To other animals… my breeders vet said it was not. His first dose of ivomec did not relieve the itching at all! Hi Nikole. It’s been a while since we went through his mange, but I can try and help. We tried the oral ivomec first, and it wasn’t enough for Oscar’s mange. The oral ivomec is the right thing to try, but you might talk to your vet next about an injection. That’s what ended up working for us. Our vet had us do several injections, each a few weeks apart, since that kills off the new mites. As for other animals, my understanding is that the pig mites are specific to the species, so they can’t live on other animals. However, while the pig mites can’t live on a dog or other pet as a host, they can “hang out” on a dog and then get back on your pig and reinfect him. We were told the same kind of thing can happen with carpet, rugs, their bedding and blankets, and other items like that which is why we also used the spray listed in one of the mange posts (just search for mange on the blog if you haven’t read that post yet). So, continue talking to your vet about your options. In Oscar’s case, it did take a while for him to stop itching so that’s possibly what’s happening for you, but I recommend talking to your vet about the injections to see if that’s a good next step for him if the itching doesn’t stop. Hope that helps! Hi, I recently bought my 1st mini pig and I am so worried about mange mites. As of now I dont believe he shows any symptoms of them, I think I am just overly paranoid. The breeder told us about mange mites and assured us that none of her pigs have ever had it. She even gave us the vet info where she takes her pigs. My question is if he didn’t come home with mange mites how would he catch them at our home?